On Inside The Formation we'll look at an individual player's performance and analyse their input into the game. Joss Bennett looks at Robin van Persie's role against Bolton. No one is more deserving in the last seven years of one hundred Arsenal goals than this man. He’s had his injury worries, he’s had speculation surrounding his future, and he’s been through the tough times at Arsenal. 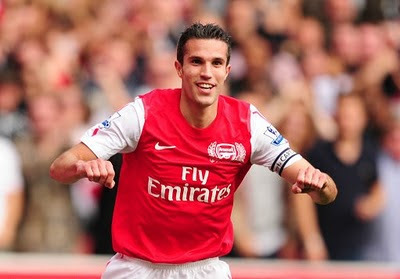 But he's come through the other side, and now Robin van Persie has yet another achievement to look back on in a sparkling career – becoming only the 17th Arsenal player ever to reach a ton for the club. And Van Persie’s performance against a struggling Bolton side who had lost 9 out of 10 league games prior to their trip to the Emirates, was fitting of the Dutchman’s achievement. In a frustrating first half in which Arsenal lacked the creativity to get behind a well-organised Bolton five man midfield and back four, Van Persie was arguably the Gunners’ best player. On 98 goals before the game, Van Persie worked hard for the team in the opening 45 minutes – dropping back into midfield to give another option to team-mates under pressure (making 12 from 16 successful passes, with 24% of them coming in a central-midfield zone) and seemingly trying everything to break the deadlock as he took 4 of Arsenal’s 9 first half shots*. After a strong first half, it didn’t take long – just 35 seconds – for the “Flying Dutchman” to get on the score-sheet and move onto 99 with a classic smashed Van Persie finish into the bottom corner. But goals are only one part of Van Persie’s game, and perhaps not even the most important part. His excellent off the ball movement makes him the perfect ‘False 9’. This means he’s able to drag defenders way out of position while the likes of Theo Walcott (and now Gervinho) get in behind the defence and into goal scoring positions – as we saw on at least two occasions with the former against Bolton, including the game-changing sending off of David Wheater, and as early as Gervinho’s debut goal against FC Koln in pre-season. Another important part of Van Persie’s game is his versatility, both in terms of positioning, and finishing. For a long time, Van Persie has followed in the footsteps of his hero and predecessor, Dennis Bergkamp – often making several assists rather than scoring 20+ goals a season; as we saw in his first full Arsenal season (2006-07) when he made 8 assists, but scored only 13 times**. But more recently – particularly after the sale of record goal-scorer Thierry Henry – he has begun doing both with extraordinary consistency; with 20 goals and 13 assists in the 2008/09 season**. He also recently played a freer role behind the striker for Holland in a game in which he scored four of Holland’s 11 goals against San Marino. And Van Persie has shown he also has all the qualities needed to play in a more straight-forward, or traditional, No. 9 role – making a classic “poacher’s” run to the near post, and finishing Walcott’s low cross with a deft touch that we usually see from the likes of Manchestrer United’s Javier Hernandez. Furthermore, a statistical breakdown of his goals shows that he has scored; 71 goals with his left foot, 23 with his right, six headers. 12 goals from outside the box, 88 from inside and 12*** penalties – displaying a remarkable variety and overall quality. ***OPTA stats from @Orbinho on twitter.